We are a leading high-tech enterprise and a leader manufacturer in researching & developing, manufacturing, marketing, and after-sales servicing of LED application lights, providing a wide range of LED lightings: LED fluorescent tubes, LED strips, LED spotlights (bulbs), LED street lights, LED modules, etc. Our products have received warm welcome and wide popularity all over the world, particularly in Europe and America. Shaoxing Iring Lighting Co., Ltd.
Short on time? Let led-spotlight sellers contact you. 6.8w 580lm for ww. It could work on all recent australia halogen transformer, like possum, osram redback. Anhui Zhaori Lighting Co, .Ltd. Ningbo Handa Imp & Exp Co., Ltd. Style color led watts lm voltage Mr16 with glass cover warm white 12-led 0.6w 50 12v Cool white 55 Warm white 15-led 0.75w 55 Cool white 60 Warm white 18-led 0.9w 60 Cool white 65 Warm white 21-led 1.05w 65 Cool white 70 Warm white 24-led 1.2w 70 Cool white 75. 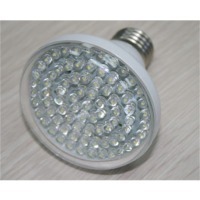 Shenshi New Light Co., Ltd. Product Name: LED Oribital Spotlights--------20W to 35W Model No: SS-EG-20-----SS-EG-35 General Parameters Rated Power 20W, 25W, 35W Working Volatge at	AC110/220V Frequency Range	50/60Hz Light & Color Light Efficiency	85lm/W Color Tempreture	2700-5700K Note: The CRI is high, Ra>85. Main Specifications COMMODITY NAME	ITEM NO	RATED POWER (W)	LIGHT LLUMINATION 20W	SS-EG-20	20	1700¡À100 25W	SS-EG-25 25	2000¡À200 35W	SS-EG-30	30	2400¡À200. Shenzhen Unionlighting Technology Co., Ltd. Item	UL-SP38121 Power	12W Equal to common halogen lamp	120W Lighting Source	Bridgelux High Power 1W LED Chip Quantity	12pcs warranty time	2 years Dimension	¦µ120*127mm Working Voltage	85-265 V Luminous flux	960-1080 lm Color temperature	Warm White: 2800-3200 K Pure White: 4000-4500 K Cool White: 6000-6500 K Material	Aluminum alloy + PMMA Lense Viewing angle	15¡ã, 30¡ã, 45¡ã, 60¡ã, 90¡ã, 120¡ã Color Rendering Index	>75% Power Factor	¡Ý 0.80 Life-span	¡Ý 50,000 hrs Protection rating IP54 Working temperature	-30~55¡ãC(- 22~122 ¡ãF) Warranty	2 years Certification	CE, RoHS and UL pending Payment term	T/T, Western Union. customized package. Dongguan Gooden Optoelectronic Technology Co., Ltd. Product name Led Spolight Item no: F-3W-020 Power : 3*1W Size: 50mm*58mm Luminous Flux: 300LM Beam angle: 35/45/60 Material: 6063ALU Surface treatment : anodic oxidation Lamp holder: E11/B22/E27/E14 Color: natural color. Colorful packing inside. Shenzhen Gracene Optoelectronics Co., Ltd.
Material: AL & PC LED quantity: 9X1W Input voltage: AC85~265V Frequency: 50-60Hz Power: 11W Luminous flux: 900-1000lm Viewing angle: 18 Lamp holder: E26/ E27/GU10 CCT: 3000K/4000-4500K/6000K Equal to: 20W traditional light. Standard exporting packing. Product Name: Compositive MR16/GU10/E27 bulb Voltage: AC100~240(GU10&E27) or AC/DC12(MR16) LED Light Source: Compositive 5W LED Lumen: >200lm(pure white). China Chairbay Group Co., Ltd. Warm white/white Voltage: AC 100 - 240V Color temperature: 3,000 - 7,000K Power: 5W No of LED: 5pcs Long service life up to 30,000 hours Base type: E26/E27 Available: 5W,9W,7W, 12W and 15W Base type: E27 Energy-saving and environment-friendly Full range of colors: cool white and warm white Superior thermal management with internal copper heat conductor and external aluminum housing Light source: Cree Beam angles: 38 and 60 degrees Body temperature: >53 degrees Celsius LED working temperature: >62 degrees Temperature: -40 to 70 degrees Celsius Brightness degradation: 3 to 5%/1kh Lifespan: 50,000 hours No UV or IR radiation Applications: Widely used in accessory lights for indoor, villas, restaurants, hotels, meeting rooms, showrooms, shops, telephone cabinets, counters and more Remarks: Read the instruction carefully before use Please ensure the label of packing matches with the actual product Please make sure the power is off before use Please choose the right power supply to match the product directly . For indoor use only Weight:0.4kg Dimensions:D50*H56. Ledmann Lighting System Co., Ltd. Features: Using the simple and special structure to make elegant appearance and improve the heat dissipating efficiency, which can prolong life span of the lamp Free of radiation, high illumination efficiency better than incandescent lamp with good light focusing. Simply mechanical assemble and instant start and LED Lamp can substitute for conventional Lamp. Parameters: Product Name LED spotlight Product Number SNSP-4WC-10Gu10 Supply voltage AC 85`240V Operation voltage DC 16V LED Number 4PCS Total consuption power 4 W Luminous flux 320Lm Center illuminace (height=3m)602Lux Color temperature White,Red,Green,Blue CRI Ra>82 Beam angle 120¡ã Operation temperature -20~50¡æ Operation humidity 10%~90%RH Strorage temperature -20~80 LED life 20000 Material Aluminum Outline dimension §¶50*60mm Net weight 70g Inrerface Gu10 Protection level IP3X.